I will be a keynote speaker. GLUCK: ART AND IDENTITY EXHIBITION AT BRIGHTON MUSEUM from November 17 2017, curated by Amy de la Haye and Martin Pel; consultant Elizabeth Wilson, Diana Souhami, Jeff Horsley, Gill Clarke, Andrew Macintosh and Simon Martin . A book of the same name edited by Amy de la Haye and Martin Pel will appear to coincide with the exhibition’s opening. It contains articles by the above contributors. Gluck was a successful painter, primarily during the period between the two world wars. She was a reknowned portraitist and also painted landscapes and flower paintings. She was a cross dressing lesbian whose struggled with identity seem especially relevant today. The exhibition is based on clothes and other artefacts. 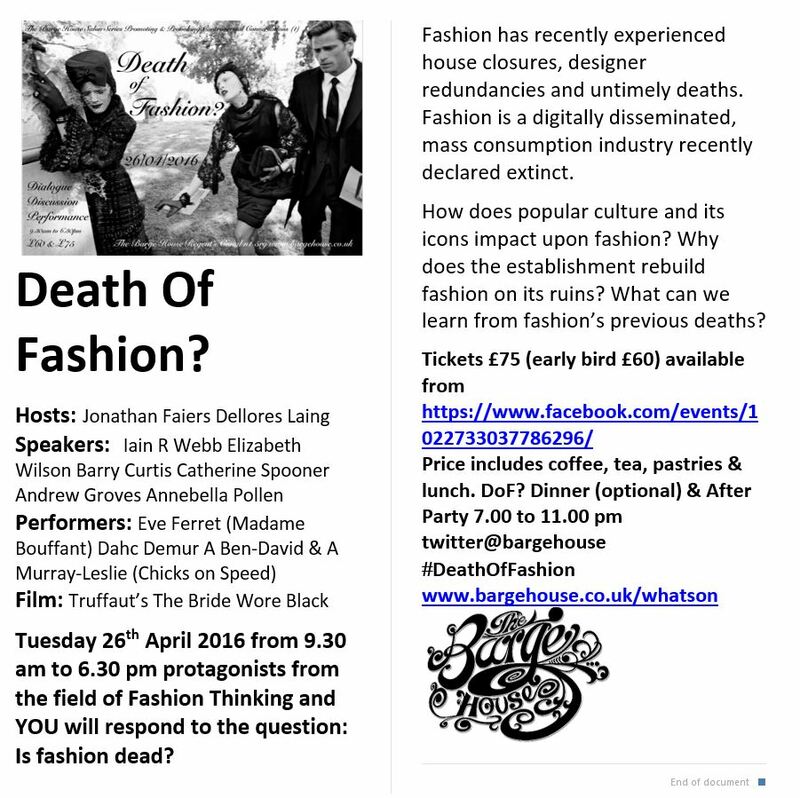 April 26th, 2016 I shall be ‘in conversation’ at ‘The Salon’ an all day event entitled ‘The Death of Fashion’ to be held at a barge on the Regents Canal. Tickets are limited – its an intimate space and event. September/October 2015: Elizabeth will be at the private view of the fashion exhibition Utopian Bodies: Fashion Looks forward at the Liljelvalchs Museum, Stockholm on 24 September, for which she wrote part of the catalogue. She will be giving a seminar at the Museum on 21 October. May 2015: Love Game: A Cultural History of Tennis from Victorian Pastime to Global Phenomenon to be published in paperback by Profile books. 21 February 2015 I shall be giving a presentation about lesbian style at the Lesbian History Conference in Brighton at 1.15 pm as part of a panel discussion on ‘lesbian fashion and identity. May 2014: Love Game: A Cultural History of Tennis from Victorian Pastime to Global Phenomenon will be published by Profile Books in May 2014.